Every moment of your life is filed with a swirl of choices. For any one thing that you do, think or stay, there is an infinite array of other possibilities that you could just as well chosen. You built your life one choice at time. The “you’ that you know is really a mosaic composed of the result of these countless individual choices in life up to this moment. As human being, you can allow these life choices to play themselves out in one of two ways. You can permit others to make for you, by means of their environmental influences or even direct orders. This is passive path trough life. Though easy to fall into, such a life of foggy and unexamined auto-pilot beliefs and actions is a tragic waste of potential. Life is meant to be lived, explored, and utilized with purpose. There is no initial need to be a Buddhist, or to be a Shugenja but you must appreciate, or LOVE Mother-Nature. To be a Yamabushi, love mountain as most important is fundamental. No need to think of you as “religious”. Religare in Latin language means “to be linked with”! We (Sendatsu Yamabushi) who have taken the trek before you (shinkyaku) wish the best of progress. Your first objective is to understand that we human have a variety of viewpoints from which we can choose to perceive life at any moment. We have an inner orientation, an emotional orientation, an intellectual orientation, a physical orientation, a cultural orientation, a time-continuum orientation, an other-centrered orientation. The list seems endless… The challenge is to see all of these viewpoints as but parts of single total part with the whole. Your mind is the most powerful aspect of broad collection of facets that makes up the “you” that you know. When your mind is clear and focused, you can be fully present in life for yourself and others. No challenge seems too great. No delight goes unnoticed. You can easily tap your deep natural wellsprings of creativity, insight, inspiration, health, and broadness of vision. You can thoroughly and completely “be there” in every moment to enjoy each new experience. You encounters with life have “spirit”. You perceive directly a sense of significance in your life. Without the benefit of carefully cultivated awareness, however, your mind can become a deadly enemy! The power exerted by worry, regret, tension, fear, negativity, dullness and anger can easily turn your life into a nightmare. Caught up in the pressure of demands and resentments, you can come to experience life as total frustration. Somewhere in the center of your being, you know that this is not the way life supposed to be. You know that something precious has been misplaced. You know that life was not meant to be so joyous for others and so lacking in fascination for you. Reality is our own individual and collective creation. What we call “reality” is that which we realize. Our original goal as human being is to understand why we are alive… True spiritual experience is then the direct perception of the relationship that exists between the conventional and the ultimate, though which we become intimately aware of our role as points in the grandness of the universal. Pure awareness, free of the limits of intellectual, emotional, cultural, or genetic perspectives, thereby recognize itself as the creator of reality. In the practice of Shugendo’s teachings leading to ultimate and supreme wisdom, there are no “beliefs” to be accepted and unchallenged. There are no “gods” to be feared and appeased. There is no “dogma” to take precedence over rational thought and verifiable experience. Doubt and personal exploration (adventure of mind, pilgrimage of heart) are encouraged! “Faith” in the teachings, if it is to be attained, is cultivated through research, and not accepted blindly out of mere hopeful loyalty. Obviously, such a program is best suited for only strong of heart. KUTAI: To the unenlightened mind, the experience of life is a characterized by the anxiety of discontent. JITTAI: Dissatisfaction with life arises from desiring to have what we cannot be had, and desiring to avoid what we cannot avoid. METTAI: Since causes always generate results, and effects always follow causes, it is possible to overcome the discontented life orientation. SHO-KEN: Proper view; “Ultimate truth is ultimate. See life as it is and stay turned in”. 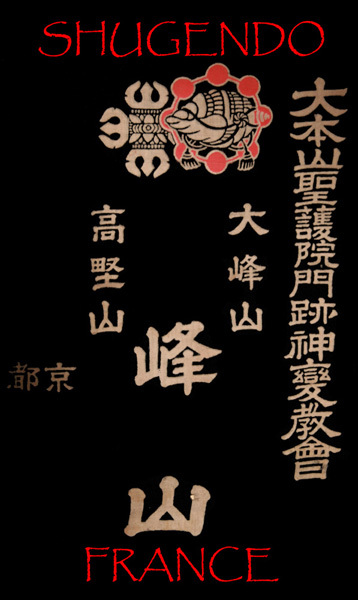 Shugen mikkyo is the mountain practice of the “Buddhist esoteric doctrines”. “Esoteric” indicates "DEEPER TRANSMISSIONS" communicated in highly symbolic language, not readily understandable on the surface, as opposed to “exoteric”. This system is an ancient method for learning how to activate the power of Consciousness. This mind science of personal development recognizes and transforms life’s building blocks in way that make possible enhanced awareness as a key to personal power in daily living. The training in mountain begins with observing how the undirected conscious mind can run away with us and cause us to see life incorrectly. The training in mountain then goes on to teach methods for experimenting to the point where our perceptions can clear. From there, we can progress on the specific practices designed to cultivate and enhance our innate potential to become a “shugenja” or “fully actualized being”. Ultimate truth “preaches itself” to universe. What is ultimately true of life itself known to those who can broaden their vision enough to see beyond conventional reality? The original Sakyamuni, called historical Buddha, “discovered” the Dharma (deep knowledge) truth of life he taught. He did not “invent” or “make up” this truth, but rather “found” it and then relayed it on his fellow human beings in the form of teachings. There was a force to ultimate truth that made itself know though Sakyamuni Highest truth “taught” itself trough the words, actions and presence of the one called the Buddha. As such, Sakyamuni known as “the physical world body” (state of human being, Nirmanakaya) exposes and demonstrates the cold and impersonal highest truth of Dharmakaya (state of ultimate body teachings). Though Sakyamuni no longer walks among us, the eternal truth of what he worked to expose is never present & fresh in its relevance. The “Dharmakaya” (Hôsshin in Japanese) ultimate truth “teaches” on though the force of Samboghakaya (hôjin in Japanese) which makes the truth recognizable.Though the original Sakyamuni “nirmanakaya” (ôjin in Japanese) is no longer a physical part of our conventional reality. We do not pray to Sakyamuni Buddha as such as. Sakyamuni is not a Savior who doles out enlightenment only to believers who apply for the gift. The forces that moved the original Buddha is, however, a potential in all of us. The underflying philosophy of Shugen Mikkyo is based on the premise we have within us all the seeds of greatness, all potential that we need. We must then break through the foggy veil of life characterized by dull sleep-walking. We must “wake up” to the reality of our inherent enlightenment. We must re-enact the Buddha’s awakening in our own lives, and “become the Buddha in this life with this body” (sokushin jobutsu). By learning to identify which causes us anguish, discomfort, and confusion in life, we find the key that allow us to rise to new heights of mindful living and transform into a rich garden it was meant to be. The Mikkyo Vajrayana “Diamond thunderbolt approach” was born in India made by the Great Masters Nagajurna & Vimalakriti in the Buddhist University and monastery of Nalanda. It is growing up, passing to China (north way) or Malaysia (south way). The Japanese Vajrayana (Mikkyo) arrived to Japan with Great Ascetic one Enno Gyoja (1300 years ago) and later with the founder of Tendai and Shingon Buddhist method: the Shugen Mikkyo is called “Zômitsu” (mixed esoteric secret teachings) by difference to Taimitsu and Tomitsu. Shugen mikkyo is the oldest Vajrayana teachings in Japan. The Japanese did not invent or “make up” the teachings of vajarayana, but old mikkyo was complete (with north and south teachings) in Japan... The Tibetan Vajrayana, born later during 11 century A.C., have quiet different development than Japanese Vajrayana, especially in some Tantra. Today, on the gate of Twenty one century, these well-establish teachings are now taking root in the culture of Western world. The spirit and force of the need to know all is personified in the Shugen Mikkyo Hero character Zao-Gongen, Fudo Myô, Kongosatta (Vajragarbha, Precious Immovable Fiery King, Diamond Thunderbolt Warrior)…The vajra is a mystical symbol of that which is ultimate in essence, and which is hard and sharp enough to “cut through” all else to get to the core of truth at the heart of all things. From the depths of our being emerges our “Diamond-mind”, pour” Diamond-ness. We have as an integral part of our makeup the ability to realize that there is more to know of life than we already know. This tendency to be attracted to the pursuit of ultimate knowledge, and an inner understanding of how to follow such a quest, is our “diamond nature”. This driving force of “Diamond Hero” summons up an archetypal form those surfaces in our personality when all the prompters are just right. We are tempted to quest on past to input of our five senses. “Diamond mind” stirs & moves us. We reveal “Diamond mind” in ourselves. This “Diamond” nature is far more than mere “left-brain” intellectual mechanics, however. We must be careful. Our intellect’s need to explore and classify can take us too into the view if the diversity of the totality of creation. The very source of that creation then vanishes to our sight. The influence of “Diamond Warrior” is that triumphant aspect of true heart that allows our investigation mind to pierce right on though the minutia of diversity. As “Diamond warrior mind”, Fudo Myo is inter & outer gate of the “pilgrimage of life”. Diamond Mind is the embodiment of rising of “bodhicitta”, or “mind aware of the innate proclivity toward enlightened vision”. Something from our depths rises far enough to catch our attention and direct us on in the quest for knowledge of ultimate truth. Once this “bodhicitta” force of “enlightenment affinity” grasps your notice, you will never be the same. Bodhicitta must be found during the pilgrimage; it is the most important purpose for neophyte, beginner on the Shugen Path. You will never again settle for smallness, complacency, and satisfaction with the surface of life. You are compelled to explore one to the heart of infinite ultimate truth. Once you have identified with the spiritual hero “diamond heart”, you put into motion to quest for the direct experience of the workings of the universals laws –knows as dharma in Sanskrit) that are the base of the experience of us all. Walking in mountain is “wandering” inside the body of Universal Buddha (dharmakaya), thinking about who you are. Contemplate the fact that who you are now is the result of years of decisions and choices in which you tried to make the best of what little you knew. What you are at this moment is the cumulative effect of all the causes you brought into being throughout your life until this moment, whether you were aware of such molding or not. The 6 worlds of “desire realm”, where the unenlightened create their own awkward life paths through the stubborn desire to believe that their own deluded perceptions of life, are the highest truth. Those who believe that is not enough live like greedy and desperate hungry ghosts. Those who believe that life is confusing live ignorant lives full of delusion and helplessness. Those who believe that life can be controlled live lives attached to that which ever changes. Those who believe that their insecurity is the fault of those they entry live with competition & intrigue. 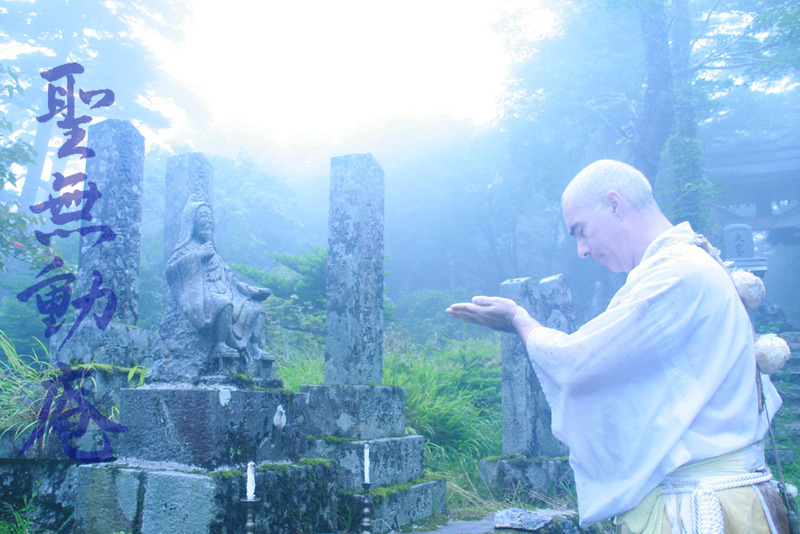 The Shomudo hermitage was founded in 2005 in the Alps in France by the Venerable Kûban Jakkôin (Sylvain Guintard), as a place of his ascetic practices in west lands, a place of worship and also a home from which to broadcast the teachings of the Shugendo in the West. In France, this is the only religious structure of Shugendo, the deep teaching of Mountain Buddhism. This is also the seat of the Shugendo Association of France. The hermitage, as well as the Association, are affiliated with the Buddhist Union of France, a Buddhist organization recognized by the French state. The "Shugendo Association of France" the role to disseminate all the Japanese teachings of the different temples of Shugendo. The hermitage of the Precious Immovable Saint (Fudo Myoo) SHOMUDO-AN was founded following the long coma of Venerable Kuban, as a sign of thanks towards the Saint Founder of Shugendo (Enno Gyoja) and of various divinities of esoteric Buddhism. The hermitage is following the miscalenious traditionnal teachings & praticing of japanese shugen Path of the Original Mountain! Shugendo being part of the Japanese culture, it is strongly recommended to the whole of its students/western practitioners to learn everyday Japanese. This Dharma is taught daily, or at monthly sessions of various levels or at annual sessions which are open to all. Since immemorial times, the Avatar Izuna protected Mount Togakushi and the body of its warriors. This is a "Kalasu Tengu" (winged Tengu with a crows head) having attributes and the posture of Fudo Myoo. It wears the cap (tokin) and the chest garb (yuigesa) of the Yamabushi. It is associated with the warrior spirit of the Yamabushi. His worship linked to water & fire remains secret! What's more worship, the hermitage exempts from the teachings on the meditation practice under the waterfalls (takishugyo) fact so left of the preliminary ones of the noviciate; asceticism of the prosternations (raihaigyo); seated meditation (type Ajikan, or Tokkogatame); meditation while walking/wandering (kaiho toso gyo); the art to blow in the conch (horagai), to hit the drum (taiko); to use the sticks of the Divination Mantra" (dokuju); reading (and understanding) sutra, writing religious calligraphy (bonji); iconographic painting (butsuga), engraving (chokoku), and liturgical song (shomyo). Winter sessions (kangyo) are only for veteran (doshu) during some days at beginning of year in Lans en Vercors, Isere, France: practice of Tokkogame Meiso (Shugen sitting meditation) and meditation under waterfall (takigyo).